What are some ways to challenge my students using Woot Math? There are many ways that Woot Math can challenge all learners, regardless of their mathematical level. Here are a few fun ideas from some of our teachers. Adaptive Learning covers key material around rational numbers with grade-aligned standards from grade 3 to grade 7. Students work independently through a personalized progression of levels that adapts based on their performance. You can learn more about this National Science Foundation funded, research-backed learning tool for your classroom here. Woot Math’s educators are also continually creating high-quality rich tasks (rich tasks are items that we consider more than just a quiz or a homework). 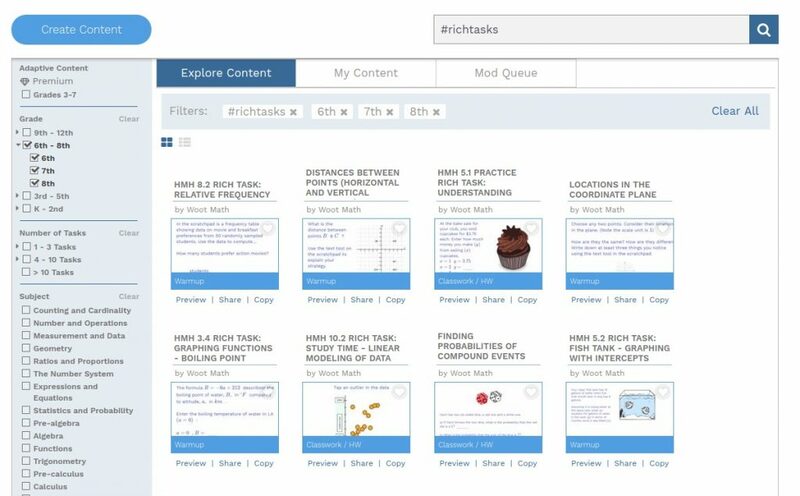 Search for #richtasks or #IllustrativeMathematics to see a sampling of these rich tasks! You can also filter by grade or topic to quickly find something in alignment with your current needs. Then you can either assign your whole class, or individual students, these questions to work on.